This is quite ambitious, I don't think I will make it in time but I'll try to put at least something playable. 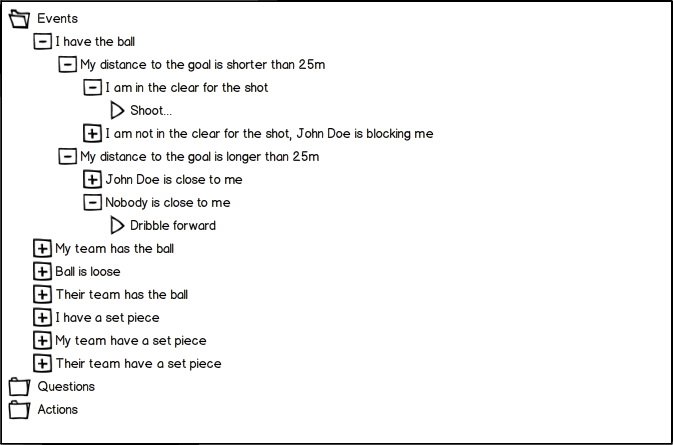 Design/program your own footballer: when he kicks, when he passes, where does he pass to, etc. Then, put your footballer on the field and see how he plays with and against other footballers (created by other people). Since I want to make it accessible to non-programmers as well, I'll try to make an interface less "programmy" and more UI oriented, probably event driven, I'll try to make a mockup of what I had in mind soon. If I finish this (which I doubt), this can be extended with leagues, getting rated by our coach and the press, etc. What are you planning to program it in? I'm probably gonna go with Haxe NME for the client, and if I manage, I'll try using Player.IO and c# for the server. Anyways, I've come up with two mockups of possible designs for the footballer designer. Basically, the first mockup is more like a draggable and zoomable canvas with a vertical decision tree, whereas the second one is a typical tree with collapse/expand. So, which one would you find more intuitive/fun/practical/etc? Is there something not clear from those images? Something you would change/add? Should I do something else entirely?